When I last purchased two packets of white poppy seeds from the Asian grocery store here, I had Aloo Posto or may be some green leafy vegetable sit/fry recipes like this Notey-posto Labra on my mind. 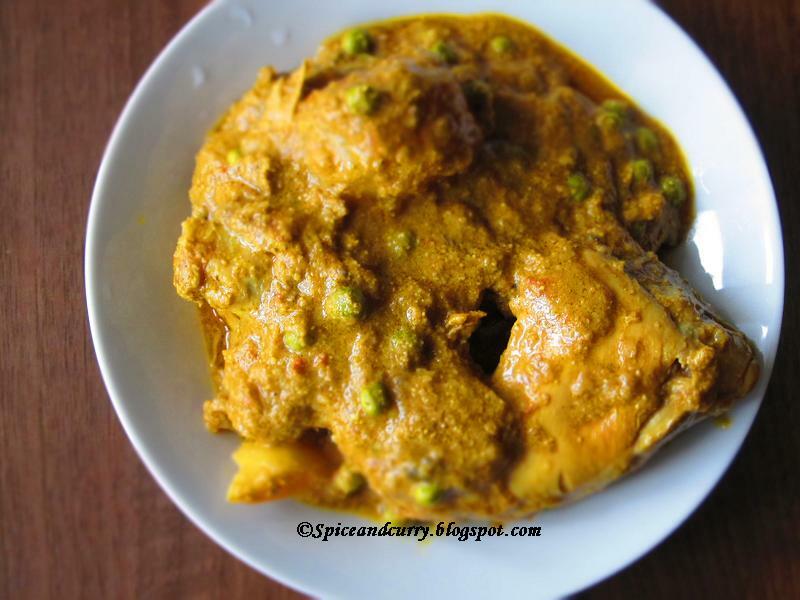 I never had any clue that few days later I will be making posto bata diye murgi or chicken with poppy seeds paste. After coming back from grocery shopping that day, I neatly put the white poppy seeds packets as my new found treasure, and then put it inside a kitchen cupboard safely. And on that day I also happened to call back home to tell my Ma that I managed to get decent quality of posto here in abroad. Another Eureka moment for me. As I was having a conversation with my Ma, she told me, she made posto murgi last Sunday and then asked me to make it someday. Instead of asking her how she made it, our conversation got little diverted towards other aspects of our life, and I completely forgot to ask about the recipe and then we hung up. This was way back, may be perhaps this being almost two months old story. 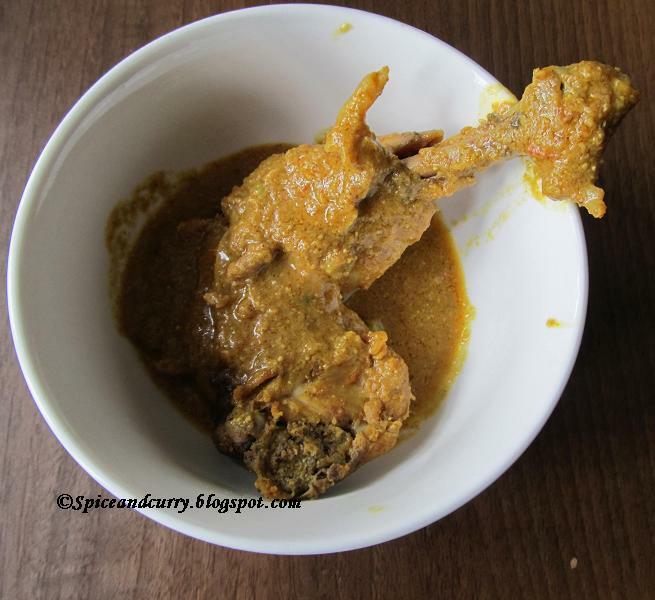 I even mentioned this perhaps on my blog’s Facebook Page that posto murgi has been made on one lazy Sunday morning. I didn’t have the time to call back again and ask my Ma about her recipe.I followed with my own instinct then and made it just like Kosha Murgi but with posto bata.Some other day I will update this post with her recipe as well. Poppy seed packets were taken out, and then it was soaked in water with some cashews. And then it was wet grinded.Posto murgi was made slowly and then pictures were clicked, short hand recipe note was written in my diary. And then it was relished by my folks at lunch, and it all ended there, but then I forgot to talk about it here. And believe me it has happened to me so many times that now I have lost count. And it ended on that point, like a bubble bursts when it comes in contact with any real surface. 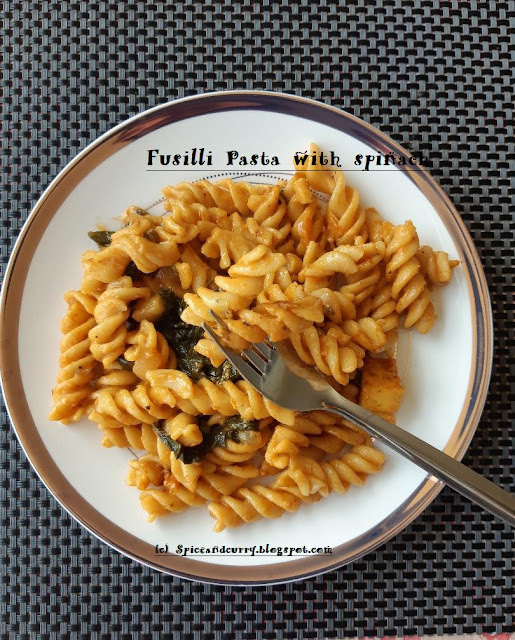 My enthusiasm to blog about it busted- as simple as that.Ok few days ago I was sorting out pictures on my computer and saw pictures of posto murgi.And since then I thought as Durga Puja is near, it will be good to share a recipe which goes well with this lively festive spirit. 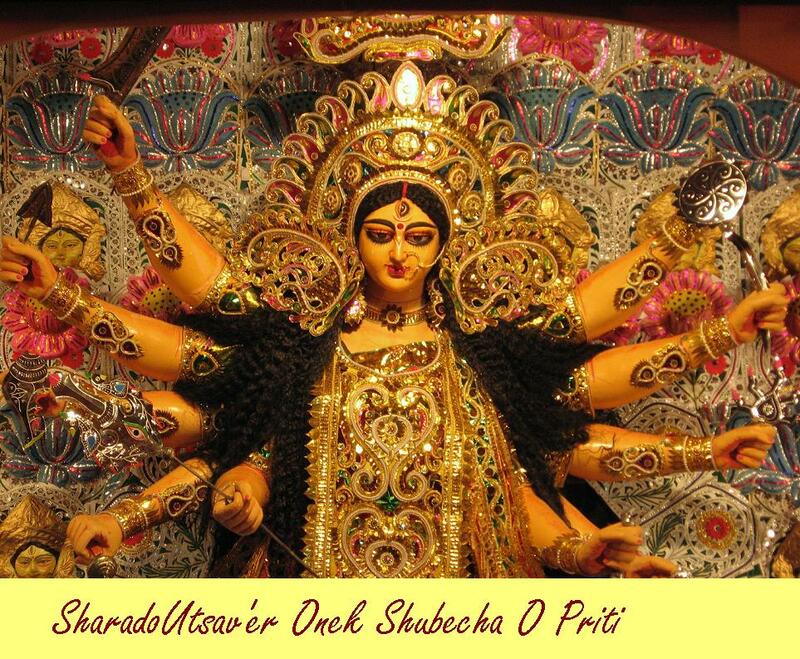 Anyhow couple of days ago it was Mahalaya, and no we didn’t get up early 4 o’clock in the morning. I was not keeping well so couldn’t imagine myself getting up that early. With seasonal change, comes viral infections also, part of life or the ups and downs of life-cycle. I still do not have recovered well, but I also can’t sit and do nothing especially if it’s Durga Puja. My dear daughter and dear husband have been so co-operating and adjusting.They are taking care of me up to an extent that they both are verge on collapsing themselves.God bless both of them.Actually we all are under the influence of weather change.A testing time for us, hopefully it will pass soon, not every days, are bright and sunny days, sometimes hovering black clouds do bring some sort of sorrow and pain with it.Just hoping and praying for a bright rainbow after this gloomy patch. It was late in the evening, sun had gone down, we all sat up relaxing on a couch and also searched on YouTube, came across this. All of a sudden certain childhood memories flashed in front of my eyes while listening to “Mahishashur-mardini”.While me and dear husband went nostalgic with our own childhood memories, our dear daughter sat and listened to all the songs- from “Jago Durga” to “Jai jai hey Mahishahsur-mardini”...and I really don’t know if ever she is going to understand what it meant, listening to Mahishashur-mardini on one cold “Ashin” morning or “Ashin’er sharodo prate “amidst all the chaos and sounds coming from neighbourhood households and then going to sleep again listening to these songs all covered up in a blanket. But somehow she felt sleepy listening to these songs, a kind of soothing effect which kept lingering in mind. Hope this soothing effect creates space for another childhood memory which will linger on her sub-conscious mind or may be once she grows up , can recall someday, one fine Ashin Month’s evening, sitting and relaxing in a couch with her parents ,cozying up with fleece,drinking a cup of hot chocolate, she listened to “Mahishahsur-Mardini”………………. Soak white poppy seeds in enough water. We will need at least 7-8 tbs of posto paste. Wet grind ½ cup of poppy seeds. Reserve rest of poppy seed paste to be used later if you don’t want to use all of it. Many times I do like to add some cashews to this paste for more richness. If you are not allergic to peanuts, then ½ cup of peanuts also adds some nice texture to posto bata. Chop onion, ginger, green chilies and garlic and make a paste in mixer. Roughly use 2 large purple onion, ½ inch ginger and 6-7 fat garlics.Add little bit of water to rotate the grinder. Add in tomato, medium size works great, however if you are using large then use 1 tomato. We will need at least 1 large cup of this paste. Now trim off chicken skin and fat if any. Pat them dry, prick with fork all over the chicken pieces. Marinate this chicken with yogurt, salt and 1 tsp of red pepper powder. Leave it aside for at least 1-2 hrs. Now heat up a saucepan, add in mustard oil. Add in tej pata, let it brown properly. Add in ½ tsp of sugar. Now add in 1 large cup of onion+ginger+garlic+green chilly paste to the heated oil. Keep on frying till the rawness is gone. Add in dry masala powder- turmeric powder, coriander, cumin, salt and sugar. Add in about a cup of water to it so that the paste and dry ingredients don’t stick to base. 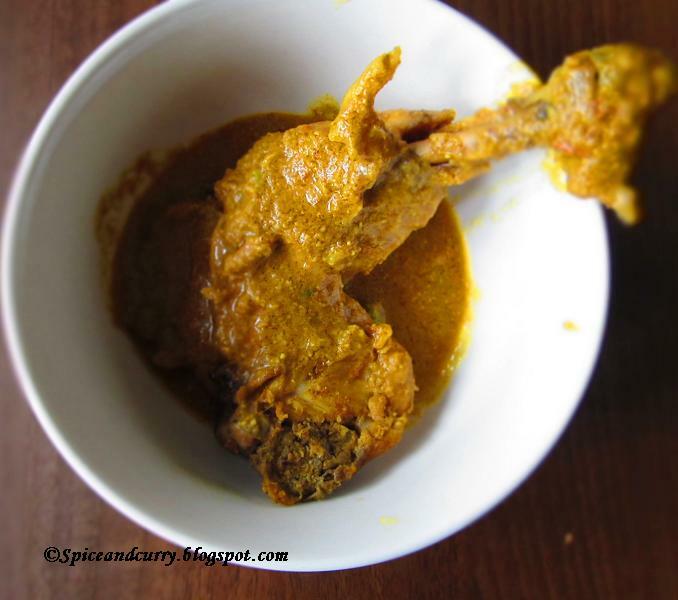 Keep on stir/fry this paste till the oil comes out from sides or In Bengali we call it “Moshla Koshano”…..
After the paste is well fried, about 10-12 mints, add in marinated chicken pieces with all the juices of marinade. Now it’s turn of Chicken pieces to be properly stir- fried. Add in posto bata and 1 cup of water. Mix all well; Keep on stir/fry – "koshano" for 10 more mints. This frying or koshano or stir/fry – whatever you want to call it needs to be done on medium to medium high flame. Cover the saucepan, and lower the flame, let it simmer for half an hour. Open the saucepan cover- add in cardamom powder and cinnamon powder. Taste the gravy, if required more heat, add in 2 green chilies slit in between. If making it for kids you can avoid it. Let it cook 10 mints more or till the chicken flesh barely falls off from bones.You can add frozen green peas or fried potato pieces as well. Take it off, and keep it covered. Add in 1 tsp of desi ghee to the above. Sprinkle coriander leaves at serving time. Many times I do fry the chicken pieces before I add them in the masala with all the dry ingredients. For best taste and flavor make this posto murgi in the morning and serve at dinner time with a Biryani or Peshwari Naan..
And I do hope this Durga Puja like always, you will cook delicious food, will also gorge on street foods, wear new crisp clothes and shoes, will get together with friends and family and will involve yourself in your community Durga Puja and do lots of Pandal hopping and … I should stop my blabbering now and let you do the way you want to celebrate Durga Puja …………………..
May you all enjoy Sharadoutsav to the fullest. Murgi posto just 'Anobodyo'. Love the curry like kasha with poppy seeds paste. Wonderful presentation on this festive days. Tomakeo janai amar sharod suvechha o priti. How r you Lubna?..long time ..and thanks for liking this post and stopping by..
Tomar posto murgi ta darun hoyeche dekhte. Pujor Shubhecha aar priti tomader sobar jonne. well, try it someday hope you will like the taste..
hope you all are feeling better now Jaya. 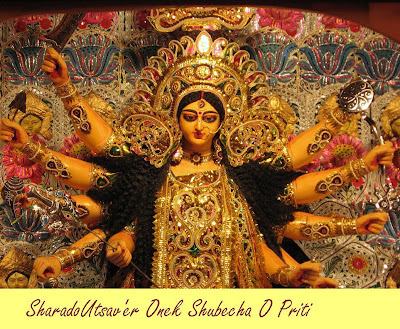 pujo kamon katche? posto murgi durdharsho dekhte hoeche...specially gravy ta. Yeah somehow still in recovering phase..dekhi kube sab bhalo hobe ..ekhon to barite chain reaction hoche :-)...thanks..
Yummy, even i cooked something like this quite a long back and everyone loved it, will give a try as urs soon..Irresistible. Hi how have you been Jaya? A very happy Vijaya Dasami to you!